When your asphalt pavement is starting to look worn and damaged, it may be time to schedule a repair service. If the structure of your asphalt is intact, but its surface is damaged, you may be eligible for a fabric overlay installation. Fabric overlay offers superior asphalt protection, while allowing the existing asphalt structure to remain in place. During a fabric overlay installation, your technicians will place a durable, watertight fabric over the surface of your pavement. Once the fabric and oil has been applied, the material is designed to fill small cracks and voids and minimize reflective cracking. This advanced fabric will create a tight bond with your new asphalt, resulting in a sleek, beautiful, and durable new surface. 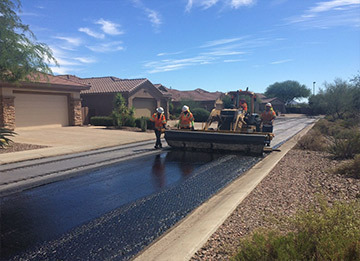 If you have questions about the benefits of using Petromat on your asphalt paving near Phoenix and state-wide, be sure to contact Cactus Asphalt. When you schedule repairs with our company, we will make sure that you are left with pristine pavement that remains in great shape throughout the years and seasons. Give us a call at (623) 207-8246 to set up a Petromat application for your property today.